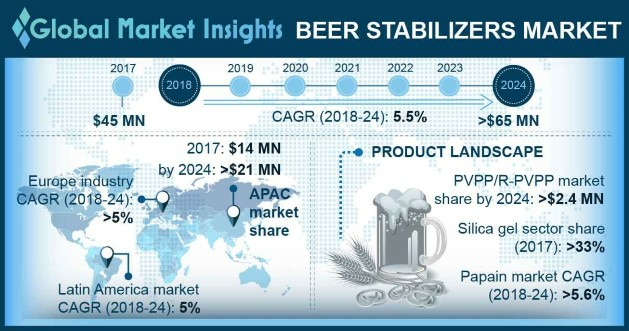 Beer Stabilizers Market size is estimated to surpass USD 65 million by 2024; according to a new research report by Global Market Insights, Inc.
Extensive applications scope including enhanced beer shelf life and removal of chemical & biological haze is propelling the beer stabilizers market growth. The biological and non-biological molecules including proteins and yeasts are absorbed by stabilizers, thus preventing the haze formation. Benefits including microbiological stability and head retention is fueling the industry development. Also, ability to retain the original flavor by preventing the formatting of stale flavor carbonyl’s is surging the product demand globally. Technological advancements towards product development to extend the shelf life and enhanced flavor retention will boost the business demand during the forecast timeframe. Penetration of alcohol-free & low-alcohol beer segment is supplementing the beer stabilizers business growth. Expanding demand for gluten -free and flavored beer will enhance the market development. Growing demand for craft beer supported by rising count of craft breweries is positively influencing the beer stabilizer market development. For instance, according to Brewers Association, the number of craft breweries in U.S. grew from 2,898 in 2013 to 6,266 in 2017. Rising count of microbreweries accompanied by necessity for enhancing the beer stability & the overall economics will develop new growth opportunities for beer stabilizer manufacturers. Silica gel dominates the global beer stabilizers market with sales at around 3,500 tons in 2017. Economic feasibility and easy availability are primarily driving the silica gel business growth. Ability to remove the most commonly found haze particularly polyphenols & polypeptides is stimulating the product demand. Ability to absorb the hydrophilic haze active proteins is strongly influencing the volume growth. Varied applicability of silica gel in the form of hydrogel & xerogel will support the segment sales over the next few years. PVPP stabilizers are projected to witness the fastest CAGR at over 5.0% from 2018 to 2024. Higher effectiveness at low contact time and relatively low dosage rates is fueling the product demand. Prolonged shelf life, negligible effect on beer flavor, along with the benefit of complete removal by filtration is augmenting the application scope. Product innovation including regenerable PVPP for improving the economics of large breweries will boost the business revenue globally. Asia Pacific beer stabilizer market was around USD 14 million in 2017. Highest contribution to global beer production owing to rising count of breweries and growing demand for beer in the region are propelling the beer stabilizers market growth. China, Japan, Vietnam and India are among the major producers in the region. According to Kirin Holdings, China is the leading beer manufacturer contributing around 21% of the global beer production in 2017. Rising demand for beer along with need for quick stabilization & improved economics will drive the product demand in Asia Pacific. Latin America is among the fastest growing regions with CAGR at around 5.0% during the forecast period 2018-2024. Brazil is the largest producer in Latin America and the third largest globally. Brazil and Argentina are among the fastest growing countries globally. According to Kirin Holdings, Brazil and Argentina’s beer production grew by 5% and 4.8% resp. in 2017 as compared to previous year. Global beer stabilizers market share is highly fragmented with large number of global and regional players. The key industry players include W.R. Grace and Company, PQ Corporation, Ashland, Eaton, AB Vickers, and BASF. Other prominent players in the industry are AEB, Gusmer Beer, QINGDAO MAKALL Group, SINCHEM, Lehmann&Voss&Co, and ERBSLOH. Merger & acquisitions along with product innovation are among the key strategies adopted by the manufacturers to expand their market share.